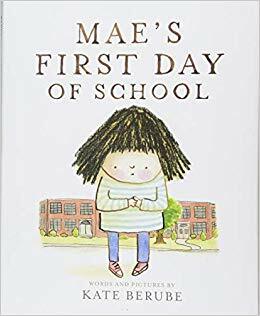 From the Book Jacket: As Mae's first day of school approaches she decides she IS. NOT. GOING. School is scary! What if the other kids don't like her? Or what if she's the only one who doesn't know how to write? Or what if she misses her mom? Mae's anxiety only builds as she walks to school. But then she meets Rosie and Ms. Pearl. Will making new friends show her that they can conquer their fears together? Why It's On My Bookshelf: Anxiety about starting school is not just common but normal. Sometimes school refusal can accompany that feeling and make things very difficult for everyone. The book starts out with Mae exclaiming "I'm not going!" Eventually she does go and makes it into school. What I like about this book is she overcomes not just her anxiety but the refusal behavior she is feeling and expressing. We can do hard things. That's a favorite motto of mine as a school counselor. This is an awesome find and read. Loved it! I just put this on hold at my local library. Your thoughts make me "anxious" to go get it!